What do you know of Mirkwood? 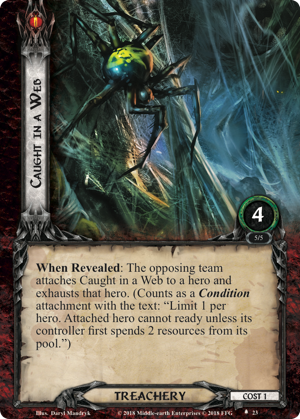 Home to Wood-elves, giant spiders, and the armies of Dol Guldur, the dark and enchanted forest has played a prominent role in The Lord of the Rings: The Card Game ever since the release of the Core Set. Players have trod its twisting paths, camped long nights beneath its dark canopy, and survived myriad encounter with Orcs, Spiders, Wargs, and haunting magic. But if you think you've seen it all by now—you'd be wrong. Like The Wizard's Quest, The Woodland Realm lets you step over the line for a moment and play the role of Sauron. 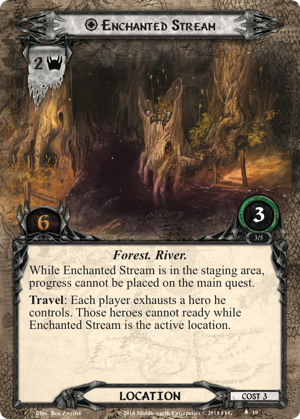 You'll assemble a quest and an encounter deck, and then you'll unleash its evils upon anyone brave or foolish enough to travel through Mirkwood! 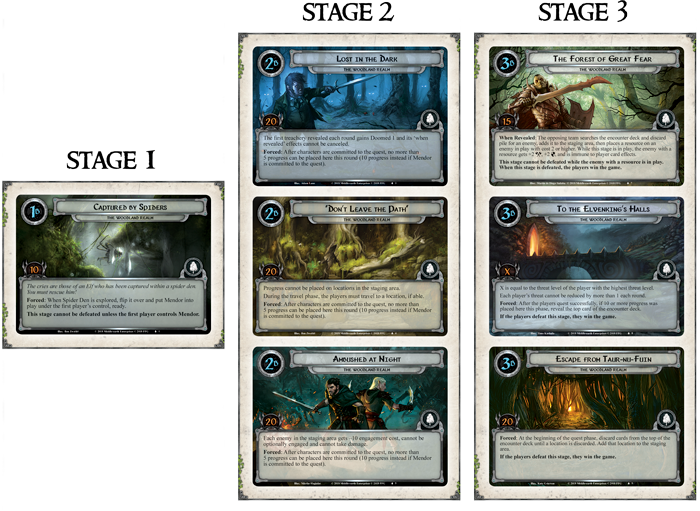 The centerpiece of your 2018 Fellowship Event experience, The Woodland Realm is a collection of fourteen different five-card encounter sets, seven quest stage options, and a handful of scenario-specific cards. 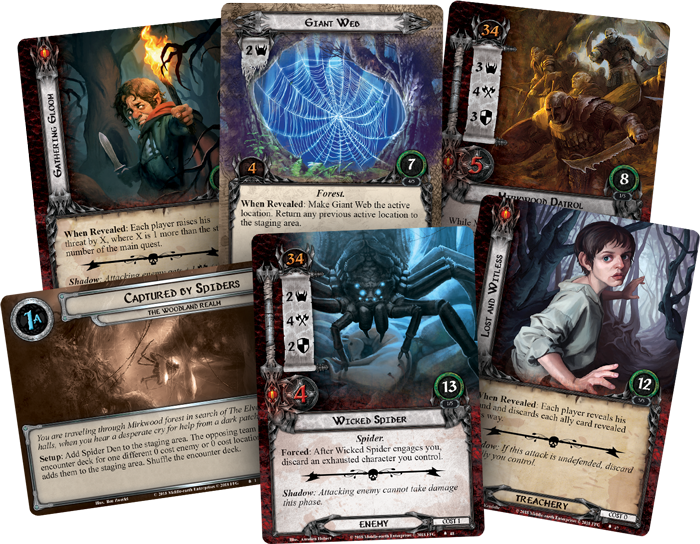 With these tools, you'll be able to piece together your own deadly, Mirkwood-based scenario, and then you'll be able to play through it—or hand it over to another group of players and let them stumble through its hazards while you race through the scenario they created. While you can certainly tinker with the cards in The Woodland Realm to challenge yourself with new scenario after new scenario, it's the way this custom scenario kit supports the game's Race Against the Shadow play mode that makes it uniquely exciting. Noble Elves, hardy Dwarves, doughty Rangers, brash Men, and brave Hobbits have long clamored for ways to challenge each other within The Lord of the Rings: The Card Game. Several years back, we responded by introducing the Race Against the Shadow play mode, in which teams play through the same scenario side-by-side and see who can complete it faster—if at all! While this play mode sated a bit of those players' competitive ambitions, even as it maintained the game's cooperative identity as teams worked together to defeat the scenarios, the Race Against the Shadow format wanted something more… While both teams faced the same scenario, the fluctuations in their encounter draws were greatly pronounced, and even though the teams were competing against each other, there was no interaction, only the pressure that one team might place upon the other by cutting through enemies and making progress toward the quest. Like The Wizard's Quest scenario kit that debuted at Gen Con Indy, The Woodland Realm adds all-new dimensions to this Race Against the Shadow format. You and your opponents will gain access to the same quest stage options and the same encounter cards, but then you'll look for ways to surprise each other with carefully selected synergies. In a Quick-build game, you'll simply select three quest stages (the single Stage 1, one of the three Stage 2 options, and one of the three Stage 3 options) and seven of the available encounter sets. In a game that takes advantage of the Advanced-build rules, you'll gain even more flexibility to build your encounter deck, carefully spending up to twenty-one total points on encounter cards. 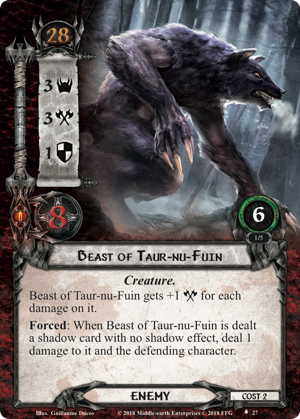 Will you aim for a steady stream of moderate one- and two-cost threats like Caught in a Web and Beast of Taur-nu-Fuin? 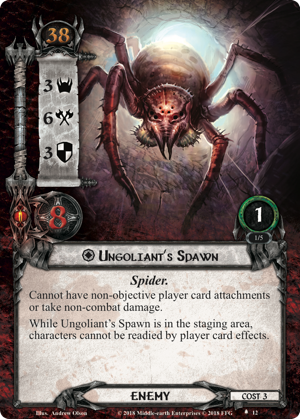 Or will you build around a smaller number of high-impact, three-cost cards like Enchanted Stream or Ungoliant's Spawn? The choice is yours, and it lends a thrilling new dimension to the Race Against the Shadow. Similarly, many of the encounter cards in The Woodland Realm encourage your interaction with the opposing team. 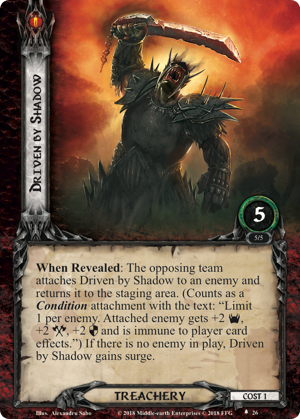 Like Driven by Shadow, these cards tell your opponents to have the opposing team—you—make key decisions about how they'll resolve. This increases your engagement during your opponent's turns and indulges your wicked sensibilities, allowing you to be (momentarily) every bit as cruel and calculating as the Dark Lord himself. Finally, the encounter sets in The Woodland Realm are fully compatible with those from The Wizard's Quest, so when both are released as products later on, you'll find even more ways to trap your opponents within the darkest corners of Mirkwood!